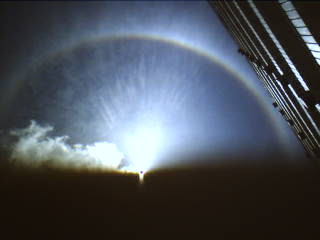 A few weeks ago, I missed the most talked about event, all because I was sleeping -_-" Remember the halo around the sun that lasted for hours? 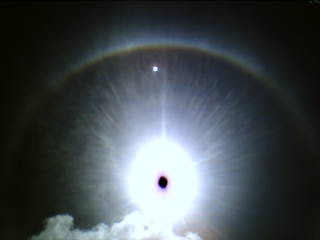 The feng shui master said that this whole halo around the sun thing was a bad omen, and that bad things are gonna happen in the future. But the meteorological side says that it isn't impossible, just that it needs the exact amount of humidity, mist, and heat to produce a ring like this. So, what are the odds of it happening AGAIN? and in such a short time frame? 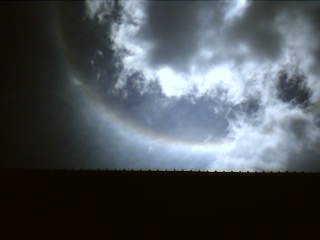 And later when I took a few more pics, I noticed that there was a second halo around the first one! And I was wondering...how can such a pretty and magnificent sight signify a bad omen? But Ron says two rainbows are a good thing *ponders* I thought I was the first person of our group to see it, so I was excitedly telling my friends when I went to school, and Izat said "Oh, it was much clearer during dawn." Well, I managed to get a few pictures of the previous occurrence from my friends, but it wasn't very clear, so I didn't really wanted to post it up =D But...what the heck. 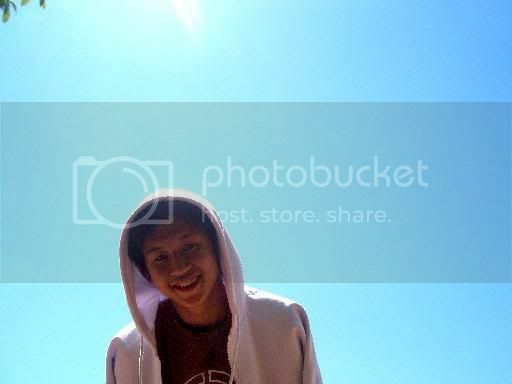 These were the pictures taken previously the first time it happened. The halo was too big, so had to take it in two segments..
At first I thought it was just a pretty rainbow, then I realised it's part of a bigger picture..
Taken in the early morning, around 8plus..did you notice the extra halo around the first one? So beautiful! This was taken at around 10:30 plus am..notice how much clearer it was? Isn't that chick everyday cuckoo in head??? yeah! given the right amount of mist, can get that liao mar. i heard it's quite a normal occurence ler. try search rainbow around sun and voila! hmmmm... bad omen or not, its a rainbow, and its supposed to be beautiful and be marvelled at. our world is already in a pretty bad shape, i doubt anything worse could happen. wah wah.. the halo is back again!